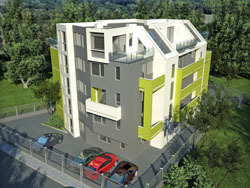 Selling two-bedroom holiday apartments for long term investments in new building in Ravda, 6 min. the beach.The building will be completely finished by the end of 2010. Panoramic lift, parking, good location of the building in the highest part of Ravda, suitable for year round use of the property. Next to the kindergarten, all the necessary communications. Two-bedroom apartments with living room, kitchenette and a bedroom.Each apartment contains one balcony, and some have even two .. the flooring is from granite in bathrooms and corridors and laminated in the rooms.Air conditioners, heat and hydro, compulsory certification, security, PVC joinery, quality implementation.